All four maps are quartered by lines indicating the Solstitial and Equinoctial Colures. These maps, like all of Burritt's charts, are based on the celestial cartographic work of Pardies and Doppelmayr. The maps were engraved by W. G. Evans under the direction of E. H. Burritt and issued as plate nos. II, III, IV and V in the New Edition of F. J. Huntington's Atlas, Designed To Illustrate The Geography Of The Heavens. 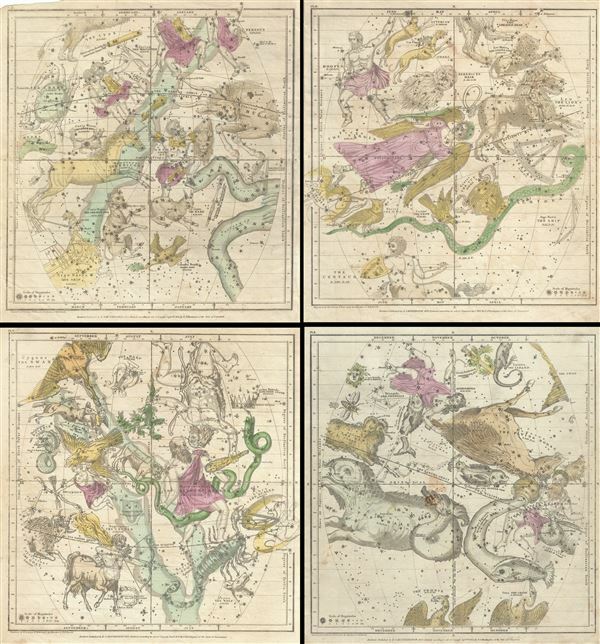 The present example is exceptional in that only a small percentage of the first edition of Burritt atlases featured individually colorized constellations. In subsequent editions, the constellation charts received a general, but non-specific wash. Very good. Overall toning. Some foxing throughout, especially over Oct, Nov, Dec sheet. Part of top left margin corner of the Jan, Feb, March sheet torn, not affecting printed area. Set of four maps.